Want to know what's here on my table tennis site? 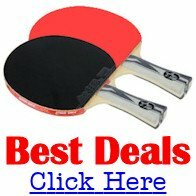 What are the size dimensions of a table tennis table? What size and type of racket is allowed? Can you play a shot with your hand? What's the difference between an edge and side? When can you volley the ball? What room size do you need to play table tennis? Information, tips and recommendations about TT equipment. Who are the table manufacturers and which tables are authorised by the ITTF? Improve your game with my tips and techniques. Why are recovery and anticipation so important? Information about the best and most famous players. Learn more about professional table tennis tournaments. Travel back in time and discover how table tennis evolved. Why did the 1930s leave such a lasting legacy? Why was a time limit required for games? Interviews with top table tennis players and manufacturers/suppliers. What Table Tennis magazines are available?